Update: The online questionnaire will now be available April 26-May 13, 2019. Through the IPP process, APS is addressing one of the implementation strategies of the Strategic Plan to ensure multiple pathways to student success: “Increase high-quality options for PreK-12 instructional models within and beyond neighborhood schools.” As APS continues to grow, there are multiple elements that come together at once as we support strong academics and the whole child including: updating policies, ensuring equal opportunity for access to programs, renovating current schools, building new schools and boundary changes. As these elements are implemented, APS is working to ensure that there is a systemic approach to how options and neighborhood schools align with this work.The IPP will provide a systemic framework that will align future instructional, capital and planning initiatives. It will serve as a guide when APS proposes new school facilities or undertakes a boundary process. Neighborhood schools have geographic attendance areas established by the School Board. Every student is guaranteed admission to the elementary, middle, and high school serving the attendance area in which the student resides. Provides equitable access to option schools/programs for all students, including students with disabilities and English learners. Provides a rational and transparent process for admission to option schools/programs, which is differentiated to support the integrity of the instructional models. Offers preschool at each of the elementary option schools/programs. Adjusts enrollment levels at the option schools/programs as needed. A list of neighborhood schools and option schools/programs can be found on page 2 of the Options and Transfer Policy Implementation Procedures (J-5.3.31 PIP-1). In April, a draft IPP framework will be shared with the community for their review, and an online questionnaire and a community meeting will provide opportunities to gather their thoughts, questions and ideas. March 21, 2019 School Representative Work Meeting School Board Room – Syphax Education Center 2110 Washington Blvd. March 21 School Representative Working meeting on the IPP: Resources include the presentation, handout (English, Spanish), and discussion points. Update: The online questionnaire will be available April 26-May 13. 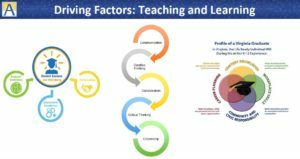 Feb 12, 2019 School Board Work Session on the PreK-12 Instructional Programs Pathway and the accompanying Presentation: Provides background on why APS is developing this pathway and what the community can expect. The 2018-24 Strategic Plan: The six-year strategic plan developed with staff and community involvement to identify focus areas for school system improvement. Options and Transfers Policy (J-5.3.31) and Policy Implementation Procedures (J-5.3.31 PIP-1): Outline the process determined by the School Board for APS to ensure equitable access for all students to the available option schools/programs and neighborhood transfers. Virginia Profile of a Graduate: Describes the knowledge, skills, and experiences and attributes that students must attain to be successful in college and/or the work force and to be “life ready” in an economy and a world characterized by rapid change. 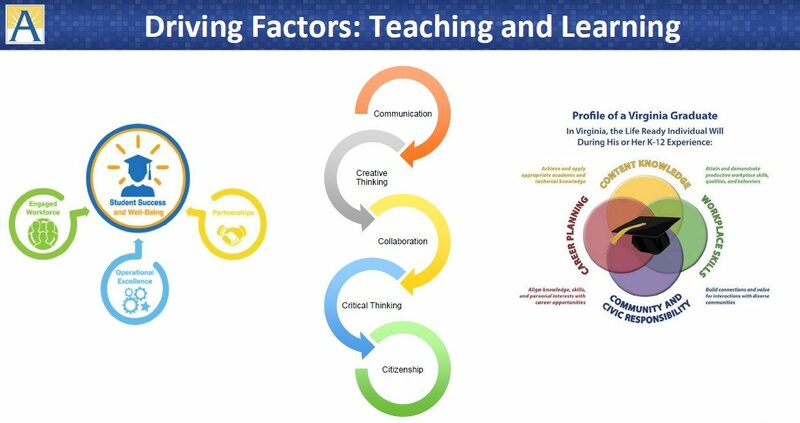 Teaching and Learning Framework: Provides an overview of the teaching and learning experiences for each of our classrooms; the curriculum templates that provide the “knows and dos,” assessments, and resources for each unit; and the professional learning experiences that provide opportunities for collaboration and learning together across the division.